What Happens When You Miss Your Court Date In Lynchburg? While you might think that forfeiting bail is the only consequences a person has to deal with when they forfeit bail, that is not entirely true. Under state and federal law, failing to appear in federal court after you are let out of jail on a bond is a crime on its own. This means that defendants who “jump bail” may have to deal with many consequences such as facing the pending criminal charges and having additional charges that they will have to face on top of their initial charges. In some states, a defendant failing to show up in court and failing to surrender without a certain amount of time is defined as ‘jumping bail’. Often this time period is 30 days from the day of the missed court date. On the other hand, some states make jumping bail an offense only when the person who is being charged is thought to have committed a felony. Either way, it is important to know what is going to happen to you when you choose to skip bail after being arrested in Lynchburg. Continue reading below to learn more. For the most part, the prosecution in certain states has to prove that the defendant chose intentionally not to show up for their court date. Often it will suffice, however, to show that the defendant was aware that he/she had a court date and that they simply did not appear for it. The only real proof that is needed in cases like this is the knowledge that the defendant received notice of the appearance date. Depending on the jurisdiction, this notice can come in a variety of forms such as a letter that has been mailed to their home or even the wording in the bail bond contract. There are a number of reasons that someone will miss their court date. It’s often a valid defense that the defendant wasn’t able to appear in court due to circumstances that were entirely out of their control. However, there are plenty of excuses (intoxication, drug use, poorly substantiated claims of illness, etc.) that can be rejected by the court. In fact, in certain states, even being arrested in another jurisdiction is not a valid excuse that can be used for why a court date was missed. If you are being charged with skipping bail or you accidentally missed a court date, your best course of action is going to be to speak with an attorney. On the other hand, we cannot stress how important it is that you show up for your court date if you are being charged with any sort of crime. 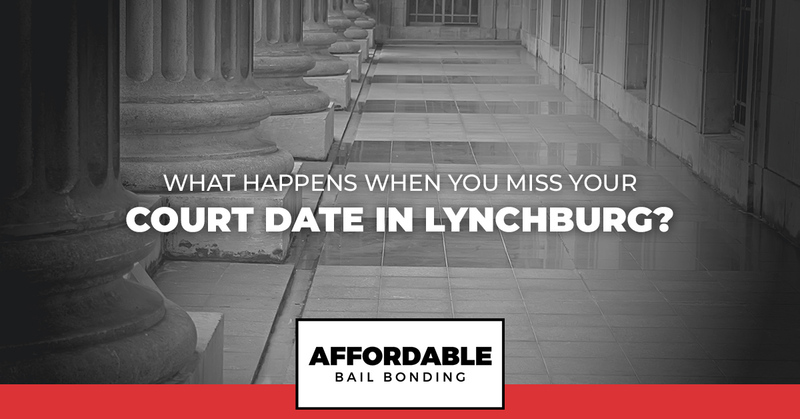 When you sign a contract with Affordable Bail Bonding in Lynchburg, you are giving your word that you are going to show up for your court date. Believe us, you do not want to have to deal with the aftermath of skipping bail, so don’t. Keep your word and your legal matters will be resolved much more quickly and efficiently.